At the point of their foundation in 1973 "Bad Company" assembled of three main band fragments. Boz Burell on bass, who left "King Crimson" after being unsatisfied with the tricky and complex harmony structure of the compositions by his boss Robert Fripp. Next was guitarist Mick Ralphs, formerly of "Mott the Hoople". The band fronted by the dominant singer Ian Hunter, who pushed the band into the new Glam-Rock trend. Mick disliked the new direction, so he left as well only to team up with Simon Kirk and Paul Rodgers from the famous British band "Free", who he met several times when "Mott the Hoople" opened for "Free". "Free" was -and still is- nowadays well known for their guitar player Paul Kossoff with his irreproducible soulful finger vibrato, his clever chord-inversions and his pure earthy sound. "Bad Company" was often wrongly disposed as follow up band for "Free". This is not actually true, for most of "Free's" songs stemming from their bassist Andy Fraser and singer Paul Rodgers. Kossoff hardly made an appearance as songwriter. As a result "Free" played mostly Fraser's music. Andy Fraser had the gift of enhancing the bass as an independent melody-instrument as well as John Entwhistle did in "The Who". In "Bad Company" the compositions were more ensemble-based with an important amount of input by Mick Ralphs. Ralphs was a root Rock player with straight fat chords, using more overdrive than Koss. Ralph's style was a broader layer sound. Koss in his way virtuosic with ventured chord inversions. His solos were reduced on the important notes without any effects straight into the amps. Two different players, two personalities with two different approaches to playing. Rodgers even played piano and second guitar live on many tunes enhancing the overall sound. Therefore "Bad Company" always sounded more voluminous and cooler than "Free", in a way slightly more American. On March, 3rd 1976 "Bad Co" played in Albuquerque, the largest town in New Mexico. Ralphs -as a habit- recorded the gig amongst many other concerts. 30 years later this extra fine recording was released as a small series only for a short period of time. It embodies one of the finest live acts of the 70s at their peak. Ralphs can be heard with a tight rich harmonic Les Paul overdrive sound and with drums and bass layering the ideal Rock basis for Paul Rodger's hoarse blues based vocals. The perfect 4 piece! 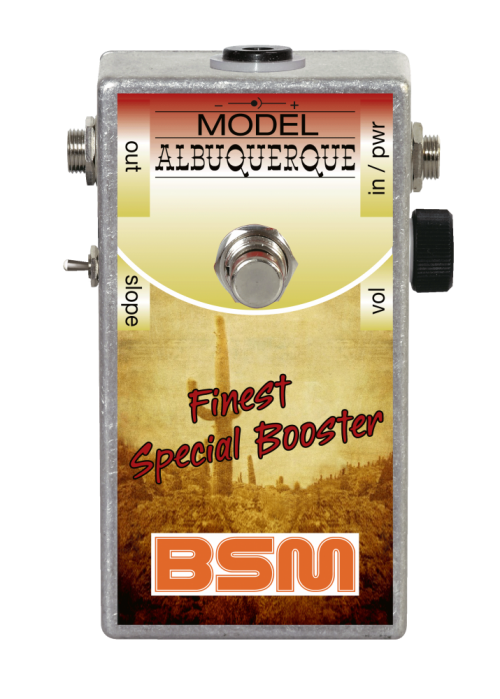 The "Albuquerque" Booster was intended as a tribute to Mick Ralphs' classic 76 Rock sound. Really a one trick pony, but what a cool one! It was mainly created for use with classic Humbucker like PAF equipped guitars so as to drive the following amp in strong overdrive saturation. This effect can be achieved with single coils as well. With the "slope" switch you can reduce the amount of bass noticeable depending on your likes and the amp's preamp characteristic. The magical tone of the "Albuquerque" Booster is achieved by the interaction between guitar pickup, booster and amplifier. The "Albuquerque" Booster should be connected in the signal path directly behind the guitar. The "Albuquerque" is powered by a 9V battery or external 9V power supply with a current consumption of approximately 260 uA. The average output level is 6 dBm, the maximum output voltage is 5V, when the strings are struck really hard. Note: The negative pole of the battery is ground. All BSM Boosters work true bypass when switched off. If you have any questions concerning our products, especially the BSM Albuquerque Special Booster, our tech-head and mastermind Mr. Bernd C. Meiser would be happy to talk to you. So don't hestitate any longer and send him an email to info@treblebooster.net or use the contact form to contact him.